Filter-feeders emerge as potential defenders against a deadly amphibian disease. 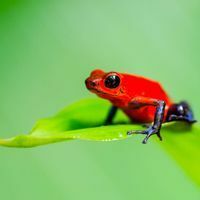 Bd affects amphibian skin, disrupting its ability to regulate electrolytes in the body, explained Jamie Voyles, an infectious disease ecologist at New Mexico Tech. Infected frogs lose excessive amounts of sodium and potassium, which are critical to keep their hearts pumping. Eventually, their hearts stop. 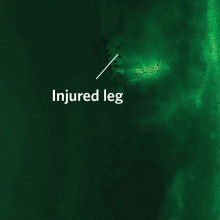 But new research suggests a potential preventive agent against Bd infection—one that may already be swimming all around the affected amphibians. Two recent studies demonstrated that aquatic microscopic fauna—such as Daphnia, Paramecium, and rotifers—can consume free-floating Bd zoospores, keeping Bd from infecting as many frogs. 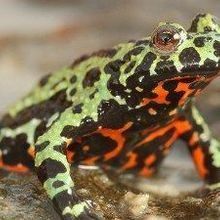 Dirk Schmeller, a conservation biologist at the Helmholtz Centre for Environmental Research in Germany, knew that Bd infection rates varied greatly across frog populations in lakes within the Pyrenees mountains, between France and Spain. Curious “if there was something in the water” skewing Bd infection rates, Schmeller—with the help of a hardy donkey—transported various lake water samples to his lab for a series of experiments he and his colleagues published in Current Biology last month (December 26). Schmeller’s team found that low-Bd lake water contained more microscopic fauna than high-Bd lake water. These microfauna were mostly single-celled organisms like Paramecium and rotifers, which feed on organic matter they filter from their aquatic environments. The team then placed tadpoles of the European midwife frog (Alytes obstetricans)—a species that’s known to be highly susceptible to chytrid fungus—in samples of low-Bd lake water and added high Bd-loads. Some of the water samples were heat-treated to remove all microfauna. The researchers found that Bd infected fewer tadpoles and with milder intensity in the untreated water. They also found that tadpoles in low-Bd water without microfauna suffered infection rates equal to those observed in high-Bd water. Next, Schmeller and his colleagues labeled Bd zoospores with a fluorescent stain to track their fates in the presence of microfauna. Many of the glowing Bd zoospores ended up in the guts of the microfauna, providing direct evidence that the aquatic filter-feeders were eating the Bd zoospores. This study confirmed previous observations suggesting that aquatic microfauna might prey on Bd zoospores, and showed that these microfauna can even reduce Bd infection. Yet in the lakes where Bd and amphibians interact, aquatic microfauna can choose from a variety of foods beyond the infectious zoospores. Would microfauna still reduce Bd zoospores in a more complex environment? 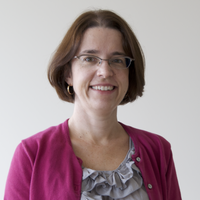 Catherine Searle, a disease ecologist at University of Michigan, attempted to address that question in an Ecology and Evolution paper published this past fall (September 23). She and her colleagues sought to see whether Daphnia magna and the smaller D. dentifera could consume Bd zoospores and reduce Bd infection among tadpoles when also provided with an alternative food, algae. Although both Daphnia species decreased Bd zoospores in the water, only D. magna appeared to help reduce Bd infection in tadpoles. Searle’s team hypothesized that the faster filtering by the larger D. magna might have damaged Bd zoospores more than the smaller D. dentifera could. Algae clearly affected the interactions among Daphnia, Bd zoospores, and tadpoles. Searle provided D. dentifera with either high or low algae supply and examined the consequent Bd zoospore numbers and tadpole infection rates. Bd zoospores survived better in the high-algae environment but tadpole infection rates did not change. 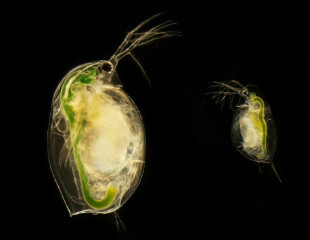 While the researchers propose several mechanisms by which algae might impede Daphnia predation of Bd zoospores, to date they remain untested. The works of Schmeller and Searle highlight the potential of aquatic predators to fight Bd. “Aquatic predators of fungal zoospores are exciting,” said Douglas Woodhams, a disease ecologist and conservation biologist at University of Colorado, Boulder, “because they are the one factor that may be more easily manipulated for disease management” when compared with factors like pond temperature or host immunity. D.S. Schmeller et al., “Microscopic aquatic predators strongly affect infection dynamics of a globally emerged pathogen,” Current Biology, 24: 176-80, 2013. C.L. Searle et al., “Daphnia predation on the amphibian chytrid fungus and its impacts on disease risk in tadpoles,” Ecology and Evolution, 3: 4129–38, 2013.